Self-driving cars from Waymo are now available for paying customers, but folks can't use them just yet in the Bay Area. Waymo One, the driverless car service owned by Google's umbrella company, Alphabet, will operate in the greater Phoenix, Arizona, area starting Wednesday. It is not clear at this time when service will expand to the Bay Area. Over the past several years, people in the Bay Area might have spotted the Waymo minivans zipping around the Mountain View area during test runs. The driverless vehicles use sensors and software to navigate roads and avoid obstacles, such as other vehicles and pedestrians. The new Waymo One program works similar to Uber or Lyft. Users simply call for a vehicle using an app, agree to the price and hop in the vehicle when it arrives. The service is only available right now to just over 400 people who have been part of the company's early rider program since April of last year. Waymo said drivers will be in the vehicles at first to supervise the process. 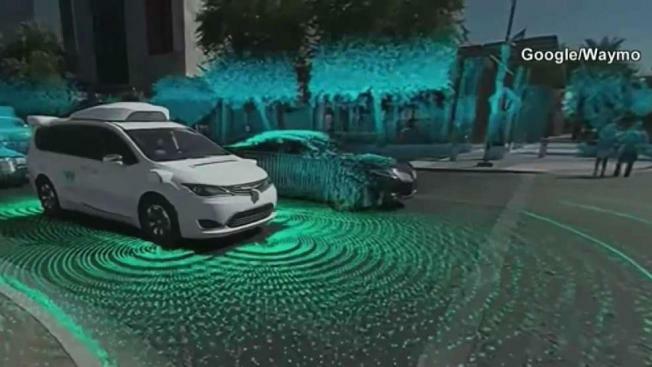 The company's autonomous cars, which have been subject to real-world testing since 2014, have driven 10 million miles on the road and 7 billion miles in simulation, according to Waymo.